(The Root) — Obesity is more common in African Americans than in other ethnic groups. But when it comes to black people and weight, that's where the agreement seems to end. Is food the culprit? Is exercise the solution? Is there even a real problem to begin with, or should we be focusing on health — or even self-acceptance — rather than the number on the scale? For the 14th in the series, we spoke to Greg Watson, senior vice president of menu innovation at McDonald's USA, at a Washington, D.C., event highlighting what the restaurant calls its "nutrition journey." What that means is calorie counts on restaurant and drive-through menus nationwide starting last month, a "Favorites Under 400" campaign featuring lower-calorie items and healthier choices (including more fruits and vegetables, and egg-white breakfast sandwiches on whole-grain English muffins) in the works for 2013. We asked Watson, who's responsible for keeping the McDonald's menu up to date and in line with customer preferences (which, these days, often have to do with health), about what the changes could mean for African Americans and obesity specifically. "We think it is just going to be a natural way for us to help out in the community," he told The Root. Here's what else he had to say about his industry's take on obesity, what the company knows about African-American food preferences and what he believes fast-food fruits and veggies could do for urban food deserts. The Root: According to the latest statistics, African Americans are 1.5 times as likely as whites to be obese. Did you consider any special focus on the needs and preferences of the black community when revamping the menu to include calorie counts and healthier foods? Greg Watson: When we develop our new menu items, we're thinking pretty broadly about the U.S. population. We know that we serve a lot of customers — somewhere in the area of 25 million every day. So it's a pretty broad consumer base. But we know that the overall trends are prevalent across multiple segments. The concerns about getting more whole grains, lower-calorie options and portion control, and more fruits and vegetables are applicable to the African-American community. And as we're developing our products, we do focus our development on different ethnic segments. There are a couple of items that do well for various segments. The mango-pineapple smoothies do very well with Hispanic and African-American consumers. 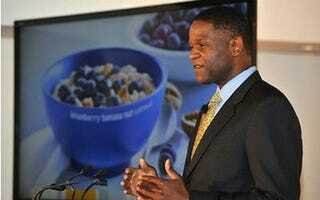 The wild berry does extremely well with African-American consumers. So we're excited that we can come up with these products that do well overall, but then they do extremely well with a certain segment. GW: I would say balance is important for your eating experience throughout the day. I would encourage our customers to think about their total calorie intake for the day, and make sure that they balance their meals appropriately. So if you go a little heavy on calories at breakfast, you should back it off the rest of the day. Or, if you work out, maybe you can have more calories. I think balance is the key word. TR: One issue that some experts we've spoken to say affects the African-American obesity rate is the prevalence of "food deserts," where fresh, healthy food is unavailable. Do you see the increased number of "wholesome choices" on the new menus — in particular, salads and fruit options — as part of the solution to that phenomenon? GW: That is a big concern for our customers that live in those areas. We're excited that we can bring more fruit and more vegetables into those restaurants. We think it is just going to be a natural way for us to help out in the community, by having these types of items on our menu. We're seeing a pretty favorable response to our real-fruit smoothies, for example — that's half a cup of fruit that our customers are getting whether they think about it that way or not. TR: What's your response to those who might say that places like McDonald's and the food and beverages they sell are largely to blame for the American obesity crisis generally, and the black obesity crisis specifically? GW: Well, we know that there is a tendency for people to make that connection, and it's unfortunate. I think that McDonald's, being the leader in the industry, is put at the center of that conversation. But what we do is we continue to focus on our customers' needs. And we know that we're giving our customers choices, and we're giving them variety. We provide nutritious options at great quality and an incredible value. The more we continue to tell that story, the less we'll be concerned about what people are saying about the industry. We're trying to separate ourselves and say, "McDonald's is doing what's right for the customers."